Creating a new product and marketing it doesn’t need to be that hard. Follow these four steps and make it a little easier. 1. Before you create a new product, listen to your customers. The emphasis is on customers – plural – not just a single customer! A single customer may have some valuable insight but it doesn’t mean it’s the “right time” to introduce something new. When a single customer talks to you, listen, begin to assess the supply and demand. When more customers ask for a product and one customer is super excited and can articulate that the demand is building, then it’s time introduce the new product. 2. Find core groups (check out the tribes that Seth Godin talks about) who are leading and driving demand. Google them. Talk to them. Let them know what you’re doing. 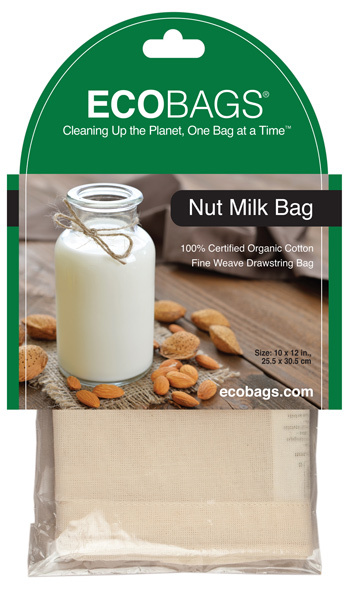 For the ECOBAGS® Organic Cotton Nut Milk Bag, we’re finding people who make their own – the DIY community. We’re tapping into groups who will enthusiastically embrace and share what we’re doing….people who are health conscious, vegans, vegetarians, non GMO supporters…the list goes on and on. 3. Focus on delivering value to the communities you engage with sampling programs like “Try Before Buy.” This will get people talking about you. 4. Have fun and enjoy the process.